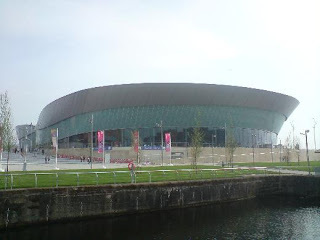 Approaching the Liverpool Echo Arena from the Albert Dock, the venue for this years' Dunlop British Open reminded me of the hulking BC Place enormodome that cast a permanent shadow of my hotel in a recent visit to Vancouver. 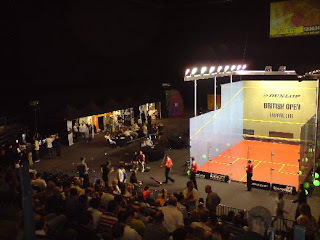 Squash doesn't often make it into venues of this ilk in the UK, and the securing of such a large berth coupled with the tie-in with the city's European City of Culture 2008 festival screamed "this is still a Big Event". But would the action inside bear this out? I was there on the Saturday (quarter finals day), and after dashing up from London early in the morning I managed to catch all of the first session. I assumed that the pinky-red banners that you can see in the photo above were advertising the squash, but when I got up close to the Arena I saw that they featured a tennis player. When I also had to queue at the box office behind a group of pensioners booking for Jools Holland for 15 minutes, I wondered if I had come to the right place. So though the venue looked mightily impressive from the outside, it wasn't exactly decked out to attract those a passing crowd - though to be fair, the Arena is right at one end of the docks. 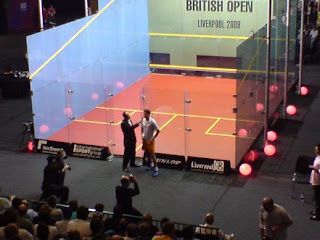 When I finally did step into the cavernous auditorium, the sight of Andy Nickeas (see last year's British Nationals report) lurking in the shadows court-right reassured me that proceedings would be well in hand. And though only noon on quarter-finals day of the Dunlop British Open 2008, the 500 or so punters lining the steeply-tiered backwall seating for Natalie Grinham v Isabelle Stoehr had decided to skip a day sittin' on the dock of the bay (it was probably the hottest day of the year so far) and catch some of the world's best squash players instead. The way the glass show court was spotlit inside the darkened arena really gave the 'stage' an added element of drama, though because the seating was so highly tiered (25 or so rows), it had to stand back somewhat so that those seated right at the top would be able to see. This gave a greater distance between the front row and the backwall than you usually get at squash events, so some of the intimacy that can build in tenser moments was perhaps lost. A large screen hanging from the Arena roof displayed the score and details of the upcoming matches (why no replays? ), and between games showed images of the Beatles to promote Liverpool's City of Culture year-long festival. The stage therefore looked mightily impressive - but what about the performances? The first match between Natalie Grinham and Isabelle Stoehr looked - on form - a comfortable win for the Australian, but although Grinham was eventually to withdraw before the end with a leg injury, it would do the Frenchwoman an injustice to characterise it as a simple walkover. Grinham's greater athleticism brought a quick lead, but her haste was tempered by Stoehr's workman-like backhand drives that stifled the Australian's game and hauled a 2-6 deficit back to 6-6. Though Grinham grumbled about not being awarded a couple of lets, these were being outweighed by Stoehr's mistakes, which ultimately cost her the game 9-6. The second started similarly, with Stoehr unable to find a consistent rhythm. At 0-4 down, a languid forehand pickup that found the front-right corner was the catalyst that gave her the confidence to risk an all-court game, and she finally started to dictate Grinham's movement. 8-4 up, it was clear that the Australian had decided to write the game off, and after throwing the next point hurried straight for the door. A three-minute injury break was announced, where Grinham received treatment to her leg, and after coming back for the third game it was immediately apparent that she could not continue. So a bitter-sweet victory for the Frenchwoman. Judging how good this performance really depends on when in the match Grinham started to feel pain in her leg. Stoehr's run of points in the middle of the second game appeared to show an ability to match Grinham in her shot selection and movement when the Australian did not appear to be in any trouble. Rematch please! Andy Nickeas's interview after the game asked the winner to comment on the prestige of the tournament, and Stoehr reflected on how tough her matches had been in the British Junior Opens in the past. Before Karim Darwish's game against defending champion I walked down and had a wander around the stands. Nice to see some proper food being served (which I didn't have time to sample), and the stalls selling the usual array of equipment appeared to be doing a steady trade. By this juncture the men's draw had really opened up, with Ramy Ashour failing to even appear on the glass court after being defeated by Azlan Iskander in the previous round at Liverpool Cricket Club. Not good for the organisers, but then the world number 1 and the existing British Open champion were making progress without too much much trouble. In my article prior to going up to Liverpool I noted that both the men's and women's events were going to seedings. With Natalie Grinham limping out and Ramy Ashour losing the day before that was all changing, though what followed next turned the draw completely on its head. Defending champion Greg Gaultier looked sharp when warming up against Egyptian Karim Darwish, and when the game started looked in no mood to hand around, killing Darwish's first serve of the match into the front left-hand nick. It was the Frenchman who continued to attack, with his opponent seemingly reluctant to take his own attacking chances when they fell to him. Darwish's patience brought the game to 5-5 when Gaultier tinned a drop, which was followed by a similar miss from the champion and greater risk taking from the Egyptian. An audacious back-court drop from Darwish saw him take a 10-9 lead, which was followed by yet another tinned effort from Gaultier that handed Darwish the game 11-9. The second game was similarly close, with Darwish now dropping at both corners with unreachable accuracy. At 7-7, Gaultier seemed to be afflicted by the mistimed drops that took the first game away from him, tinning twice on his forehand from font court. Darwish hit a millimetre-perfect forehand attacking boast from mid-court - his first really wristy attack of the match - to take it to 10-9, before closing out the game to take a 2-0 lead. By the third it was clear that Gaultier was going to struggle to retain his title. Darwish was now mixing it up, wrong-footing his opponent and forcing him into more and more errors. What was really disappointing was the way Gaultier appeared to give up at 3-8. The last points were deliberately thrown away, with the match-point ball hit out of the court. Natalie Grinham had done something similar in the match before, but she was clearly suffering from an injury. Gaultier's reluctance to fight for the title gave little creedence to the prestige of the British Open title that was to be emphasised a number of times throughout the day during the post-match interviews. Full credit then to Karim Darwish, who spoke afterwards of this desire to win the famous tournament and the extra focus that he had given to it when preparing for his trip to Liverpool. I had noted in last year's British Nationals that Jenny Duncalf seemed to be developing a resolve that could see her graduating from domestic success to international title winner. If one point bore this out more than any other in her match against Rachael Grinham, it was at 5-2 up in the first game when she retrieved a ball from round her back to keep in the point. She was playing with a panache not hitherto seen, a willingness to match the elder Grinham sister's variety of strokeplay that had emerged from her greater confidence. At 5-5 both players looked to lob as first defence, a tactic that I had seen Rachael use to devastating effect in the 2004 British Open final in Nottingham, when she lobbed Natalie Granger out of the game on her way to her second BO title. Duncalf had obviously done her homework, and when this didn't work for Grinham, the Aussie switched to attacking boasts from mid-court to win the serve back. Still Jenny wasn't phased, anticipating well to take the first game 9-5. To predict that Grinham was going to follow the men's champion by throwing in the towel and give up her title would have been to underestimate an Australian's attitude towards competition. In typically dogged Aussie fashion, Grinham came right back in the second, taking the game 9-1 and suggesting that normal service had been resumed. But the Englishwoman refused to acccept that the first game had been an aberration, repeating her tactics from the first game to win the next two 9-7, 9-1. It was the first time that Duncalf had beaten Grinham, after four previous meetings where she had only managed to take two games in total from the three-times British Open winner. Jenny was "thrilled" to be in the semi-finals. There would now be a new champion in the women's event too. 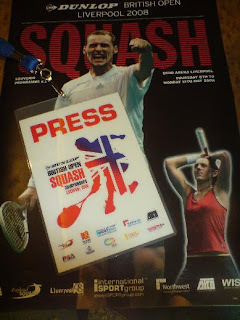 World champion Amr Shabana has not won the British Open, and in this scrappy match against three-time winner David Palmer he never looked liked a real contender. 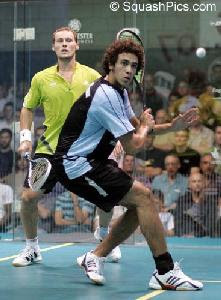 When I saw both players in the Nottingham final in 2004, it was a very different Egyptian on court than the one who is currently the best player in the world. Shabana back then was a great shot maker, but had not aquired the discipline that would bring him three world titles and the world number one spot. So I was hoping that this match would demonstrate the greater maturity that the past four years have brought. The Egyptian started sprightly, so quick on to the ball, wrist snapping like a whip. Palmer was struggling for rhythm, but brought a 1-4 deficit back to 7-5, now starting to put Shabana on the defensive, At game point, the Australian put away a forehand kill with real venom, indicating to all those in attendence that a fourth title was not going to be an optional extra for his trophy cabinet. In the second - as Grinham had done to Duncalf - the higher-ranked player started to justify their status. Shabana shot into a 5-1 lead, holding the ball well and taking the ball deceptively late. A succession of Palmer tins saw the Egyptian run away with the second 11-3. The third game was crucial in this match. Palmer threw the kitchen sink at Shabana, but the Egyptian seemed to soak up everything coming his way, showing that his defence matches his mercurial shotmaking. The presure from the Australian began to finally show as Shabana made a number of errors to hand the game to Palmer 5-11. In the fourth, the game got scrappy at 8-8, with Shabana falling and being denied a stroke, then Palmer being given a dubious let when the ball looked down. Ever the professional, Palmer appeared less affected by these delays than Shabana, and regrouped to take the match 11-5 as Shabana grew more frustrated and appeared towards the end to run out of steam. Run out of steam or given up? Again it was difficult to tell. A tournament that was quietly running to seedings had produced a run of upsets, but while this is great for the underdog-supporting neutral, the organisers would have surely wanted to see an Ashour or Shabana contesting the final, especially given the infrequency with which they visit these shores. Jenny Duncalf's march to the final of the British Open continued after she went on from her victory over Rachael Grinham to beat Stoehr in the semi-final. Here she faced Nicol David, the World Champion who had only dropped one game en route to the final (against New Zealander Shelley Kitchen). The difference in class evident from the 9/1, 10/8, 9/0 result showed that there was only ever really one name on the trophy, and the Malaysian collected the title for the third time. The men's final lasted nearly three times as long, and from reports appeared a five-game minor classic. As I wasn't there it wouldn't do it justice to try and summarise the march, but a report can be read here. Suffice to say, it went right to the wire (or should that be frame?) in the fifth, with Palmer (who had overcome Dawish in the semis after the Egyptian had to retire with an injury) finally triumphing 13/11 over James Willstrop after what sounda like either a fluke or a dubious call. So, Palmer became champion for the fourth time. With two World Opens to add to his four British Open titles, surely it is time - as he moves towards the end of his career - to reassess his standings in the all-time greats. Though the Australian is of the same generation as Peter Nicol and Jonathan Power, he is seldom talked about in the same breath. Is this down to his style of play? His temperament? A question for another time. What wasn't in doubt was Palmer's commitment to the event, and he - if maybe not others - approached this year's British Open with an eye on the title and the accompanying prestige that he still obviously feels worth fighting for. Good on him. And good on the organisers for securing a great venue. The British Open is still building its way back from the uncertainties of previous years, and fittingly got the final it deserved. But the status of the event requires commitment from all of the top players, and I can't say for certain that some of them gave it here. With Amr Shabana and Ramy Ashour trading blows around the world in the biggest finals on the PSA Tour, it's been a while since we saw either of them in the UK. That's about to change in May, with two of the most prestigious men's events being held in Britain. 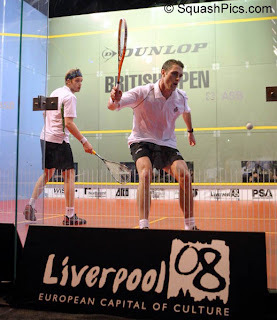 The self-styled "Wimbledon of squash" (a moniker I have questioned in the past) will this year be held at the ECHO Arena in Liverpool, as part of the city's European Capital of Culture celebrations. 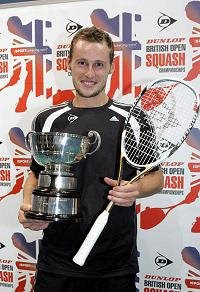 The British assault on the title will be without 2006 winner Nick Matthew, with the Sheffield man struggling to return after a shoulder injury, though James Willstrop will hope to continue a good run of form in challenging the top French and Egyptian players. The pick of the first round draws appears to be number 2 seed Ramy Ashour v rising English prospect Alister Walker. Walker recently scored his biggest win, against Gaultier in the Canary Wharf Classic, and seems to raise his game against the top players. 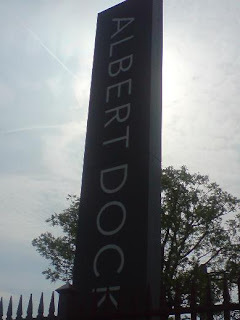 I'm also looking forward to seeing the new venue, and how the event is building towards regaining its status. The Atco Super Series Finals 2008 will follow the BO by returning to Broadgate Arena in London on 19th-23rd May after moving temporarily last year to Manchester. Egyptian prodigy Ashour won the event last year at his first attempt, and this year will be joined by Shabana, Greg Gaultier, David Palmer, James Willstrop, Thierry Lincou and Wael El Hindi in the tournament. Below: a video of Thierry Lincou from the French TV channel Stade 2 made at the Super Series in 2006. Tickets for both events can be purchased through the iSPORTgroup by clicking here.